Researchers have created a metal coating that rapidly heals over scratches and scrapes. The coating helps prevent corrosion. It self-heals in a few seconds when cracked, scraped, or scratched. By healing these tiny defects, the metal coating could prevent localized corrosion. Localized corrosion can cause important structures to fail. A tiny crack can take down a massive metal structure. Hard-to-detect corrosion in a tiny scratch can sometimes cause pipeline ruptures and the collapse of bridges. It can also cause fuselages to detach from airplanes. The researchers, from Northwestern University and the Korea Institute of Geoscience and Mineral Resources, wrote about their research in the journal Research (citation below). The authors were Alane Tarianna O. Lim, Chenlong Cui, Hee Dong Jang, and Jiaxing Huang. When damaged by cracks and scratches, the metal coating readily flows and reconnects to heal rapidly right before your eyes. The researchers have applied for a patent for their self-healing material. They demonstrated that the metal coating can heal again and again. It can even carry on healing after scratches appear in the same place almost 200 times in a row. Most currently-available self-healing coatings work for micron-sized or nanometer-sized damages only. One micron = one-millionth of a meter, while one nanometer = one thousand-millionth of a meter. To create a metal coating that could heal scratches in the millimeter scale, the researchers looked to fluid. However, common oils flow too fast. So, Prof. Huang and his team had to develop a system that was fluidic enough to flow but not too fluid. If it were too fluid, it would drip off the surface of the metal. The researchers achieved their objective by creating a network of lightweight particles to thicken the oil. In this case, they used graphene capsules. The network fixed the oil coating. In other words, it prevented it from dripping. However, when the network suffered a scratch or crack, it released the oil flow readily to reconnect. According to Prof. Huang, one can make the material with any hollow lightweight particle – not only graphene. Graphene is the world’s strongest, lightest, and thinnest material. It is just one atom thick. The new metal coating sticks extremely well, even underwater. It also sticks in acid baths and other harsh chemical environments. 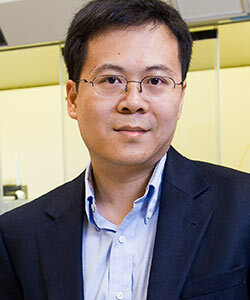 Prof. Huang believes his metal coating would help protect bridges and boats whose structures are partly underwater. It would also be useful for structures near spilled or leaked highly corrosive fluids. “Self-Healing Microcapsule-Thickened Oil Barrier Coatings,” Alane Tarianna O. Lim, Chenlong Cui, Hee Dong Jang, and Jiaxing Huang. Research, Volume 2019, Article ID: 3517816. DOI: 10.1155/2019/3517816.